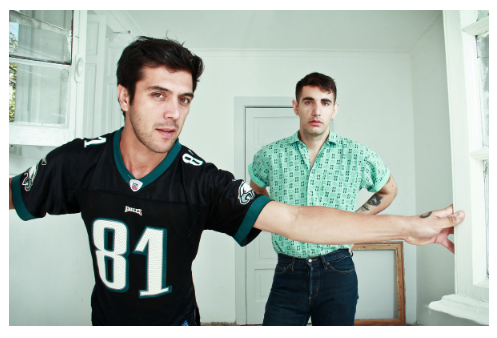 ‘Alex & Daniel’ is a collaboration between two of Chile’s most celebrated pop pioneers Alex Anwandter and Daniel Riveros (Gepe), who were brought together by a mutual admiration of the other’s music.The album ‘Alex & Daniel’ will be released via Nacional Records on August 19th. As a duo, the two artists seamlessly fuse the dance-pop and heartfelt balladry that characterize their individual sounds.Alex Anwandter, celebrated by critics and fans alike as the “Prince of Chilean Pop,” is one of the leading names of Chile’s new vibrant pop scene. Alex Anwandter brings together 80’s-influenced dance music and emotional songwriting, presented with an engaging live performance full of intimacy and showmanship. Alex Anwandter’s debut solo album, “Rebeldes” was released in 2013 via Nacional Records, and received heavy praise from outlets including Billboard, NPR, PerezHilton, and many more. The album’s romantic melodies, lush strings, and poignant lyrics tug at heart-strings, while crisp percussion and upbeat basslines keep the body moving. Daniel Riveros, otherwise known as Gepe, began his musical career playing with Chilean singerJaviera Mena. His solo career has been a major influence on the emerging new Chilean pop sound, with a combination of folk and electronic music with contemplative songwriting and undeniably catchy melodies.